Elizabeth and I took the girls to see the new movie The Muppets recently. It’s only fair to tell you up front that I am a huge fan of the Muppets, and of Jim Henson. 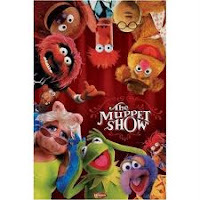 The original Muppet Movie is still one of my favorite movies, and as a kid I was a big fan of The Muppet Show TV series. I also have to admit that, after Jim Henson’s passing, I noticed differences in the characters, the kind of humor, the voices themselves, that made me care less about the Muppets than I used to. So, when I heard they were making this new movie, I was not very optimistic. When the trailer came out, followed by the TV commercials, I saw very little in any of it to change my mind, or to convince me that this new film would do much to reverse the Muppets’ flagging fortunes. I didn’t know if was even possible to recapture the magical spark that the best of the Muppets had in it, and I wasn’t interested in anything less. Truthfully, I half-expected that the movie would turn out to be an empty, contrived, disingenuous mess. I tend to shy away from writing standard reviews of movies because, for one, there are already plenty out of people out there reviewing movies, and also I don’t really enjoy writing in that style. I much prefer to find a different way of expressing my thoughts about a film (for a good example of that, have a look at my review of Cars 2). When I write about a movie, it’s more likely because I saw or felt something that I wanted to explore or understand better, or derived some clear idea from it that I wanted to share. In this case, I’m interested in explaining just what it was that made The Muppets an amazing movie to me and why, as I left the theater with my family, I was filled with the feeling that the Muppets had been restored, or rescued, or renewed in some way by this film. And that’s a good feeling, because to me, the world is a better place with the Muppets in it. I think, more than anything, the magic of The Muppets comes from its ability to draw directly from the original movie’s spirit without ever feeling like a retread. When I think about what made the first film so wonderful, I think first about how delightfully zany, cheerfully raucous, and innocently exuberant it was. There were jokes and sight gags by the bushel, and cameos from almost every major living comedic actor of the time. The tone was celebratory, uplifting, positive. The original Muppet movie joyfully wallowed in its own movie-ness, playing with clichés of character and plot, and unapologetically and gleefully smashing the fourth wall (figuratively and literally, when that big monster from the used car lot rips through the movie screen at the end) to reach a welcoming hand out to the viewer. Ultimately, what The Muppet Movie did best was to illuminate the joy of having fun, not by showing us what fun looks like on a big screen, but by drawing the audience into it. The Muppets returns to a similar tone and style of humor, that while perhaps not as brilliant or pervasive, is funny and infectious and just as celebratory in nature. The difference, I think, is that the original seemed to celebrate the world around it, while the new film celebrates the Muppets themselves. At any rate, it was great to be reminded of how much fun it can be to spend time in their world. In addition to sharing a hopelessly contagious and playful enthusiasm, the two movies are connected by a common theme. At its heart, the message of the original Muppet movie was about discovering who you really are by committing yourself to your dreams, both as an individual and collectively. The Muppets embraces and explores that same idea (although in a very different way), but goes one step beyond to deal with the issue of rediscovering yourself. 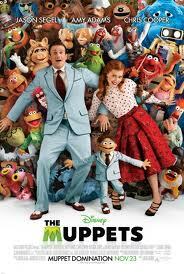 The new film begins with a new Muppet, Walter, who is part of a small-town Midwestern family. 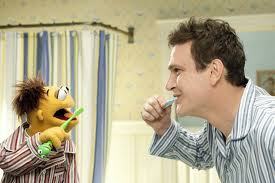 He has a twin brother Gary, played by Jason Segel, who is obviously a human. From the beginning the two are inseparable. As they grow older, Walter realizes more and more that he’s different, that he doesn’t seem to fit in like Gary does, and that he can’t do an increasing number of things his brother can do (like get bigger, for instance, or get a girlfriend). With the exception of Gary, he’s alone. Gary recognizes this and devotes himself to his brother, making it difficult to have his own life. Just ask Gary’s girlfriend, Mary (Amy Adams). It’s interesting to note that the film never even attempts to explain how you could have two brothers, twins in fact, where one’s human and the other’s a Muppet. That, to me, was a very smart thing. Nothing would have killed this movie faster than to try and contrive a believable explanation for something that is essentially inexplicable. Intentionally, the film doesn’t try, and because of that, we are forced to accept this crazy, amiably-skewed version of reality without feeling obligated to justify in our own minds everything that happens. At some point as he is growing up, Walter happens to see The Muppet Show on TV, and quickly becomes obsessed with the Muppets without ever seeming to understand why. He goes through life, never suspecting a greater connection to them, other than that of an extremely passionate and committed fan. When Gary and Mary plan a romantic vacation to LA, Gary surprises Walter with a ticket to join them, knowing how much it would mean for his brother to see the legendary studio headquarters where the Muppets made their famous TV show, and where they presumably still reside. Once they arrive, they discover that the studio is an abandoned wreck, and Walter learns that an evil oil baron is planning to acquire the location for the oil that’s under it. Sound a little weak? It is, but this movie isn’t about plot, it’s about the Muppets and the message. 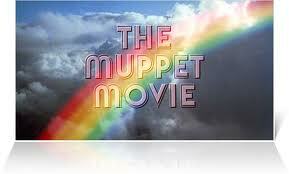 The rest of the movie is a desperate attempt to reunite the Muppets and put on a show to save the studio. Through the process of working with the rest of the Muppets to organize and produce the show, Walter begins to figure out who he is. If it seems a bit implausible that Walter could get so far along in his life without realizing that he is, in fact, a Muppet, and therefore would be happiest doing what Muppets do, I would encourage you to think about your own life, and what obvious truths have sat in front of you for God knows how long without you seeing them, until the day you saw them. I know I don’t have a leg to stand on in this department. By the end, Walter makes his rainbow connection when he realizes that he shares something in common with the frog, and the bear, and the pig, and whatever Gonzo is. He finally figures out who he is supposed to be, and when he does, he finds a home, acceptance, belonging. One thing I found touching, even a little unsettling as I watched the film, is how tightly Walter clings to his brother right until the very end. His fear of letting go of Gary holds him back and almost prevents him from seeing (or taking) the path to his own happiness. For me, it was an uncomfortable moment in the movie, and an example of how surprising the truth can be when it comes from an unexpected place. For Walter, The Muppets is a journey of self-discovery, like Kermit’s in the first film. But for Kermit, and the rest of the original Muppets, the new movie is about rediscovering themselves, and that means dealing with the aftermath of success. For those Muppets who have been there since the beginning, the journey is no longer about how you find and pursue your dreams, but what happens once you’ve achieved them. Kermit and the gang have had a good run. They had the monster (no pun intended) success, the fame, the fortune; they had it all. But it was always a team effort with the Muppets, and as time passed, things changed. For many of them, their next dreams were individual ones, and so the common bond that brought them together gradually dissolved. Each went their own way, some more successfully (Gonzo) than others (Fozzie). By the time Walter reaches Hollywood, the Muppets have been over for a long time, at least since Muppets from Space by my estimation. Here the movie poses a serious question: What are you supposed to do once you’ve accomplished what you set out to do, once you’ve lived your dream, once you’ve passed through the Promised Land, but there’s still life left at the end? The answer, the movie tells us, is simple and obvious: Get another dream. Walter, Gary and Mary find Kermit and convince him to try and reunite the gang in an effort to raise the money needed to save the studio. The idea of bringing everyone together again inspires and reinvigorates Kermit, who had seemed resigned to living out the remainder of his days as the genial, if wistful, custodian of what once was. What they find, as they travel around finding lost cast members and trying to persuade them to believe in this new dream, is that each one is ultimately willing to cast off his or her own personal vision for one that unites them. It’s a powerful idea, and a promising one. It’s also perfectly consistent with Henson’s way of looking at the world. In fact, Kermit and Piggy sing “The Rainbow Connection” together during the telethon, beginning it as a duet (Piggy even refers to it as “their song,” although it was originally Kermit’s song alone). I think this shows that Piggy has changed, or that she was never entirely who we thought she was. When the song expands to include the entire cast, it tells us that the song belongs not even to the two of them, but to all of them, and by extension, to us. It is a song written for and by an individual, but it can be sung by everyone. If you think about it, the significance of collective success is integral to all of Henson’s work. If you’re around my age, when you even think about the concept of cooperation, I’ll bet the first thing you think of is Sesame Street. I just saw the Henson’s “Emmet Otter’s Jug-Band Christmas” over the weekend. If you remember the story, Emmet and his mom separately and secretly enter a talent show with the hopes of winning so they can afford to buy a Christmas gift for the other. In perfectly Hensonian style, they both lose the contest after putting themselves essentially in direct competition with each other. However, as they’re heading home in mutual disappointment, they join their separate songs together, and produce something which exceeds either’s individual effort. Doc Bullfrog happens to overhear them singing, and is so impressed by their talent that he offers them a job singing for his customers, “starting tonight.” In Henson’s view, the result of working together to realize a dream is always greater than the sum of the individual dreams. Perhaps by now you’re saying to yourself, Kevin, come on, relax a little. These are Muppets. They’re nothing more than colorful, some would argue distastefully gaudy, bits of felt and fuzz glued together. They’re fluff, designed to entertain the children. Don’t you think you’re taking this all just a little too seriously? I suppose that’s possible. But don’t you wonder why it is that the Muppets have been around for more than 40 years, and still have the power to entertain new generations of children? Think of all the thousands of different varieties and brands of children’s entertainment that have come and gone in that time. Why do the Muppets persist? Why do the great Disney classics live on? Does anyone doubt that our grandchildren will still be watching great Pixar movies like Toy Story and Up forty years from now? My point is that if you want to build something that lasts across generations, you better find a way to talk to the adults while you play with the children. And if you really want to get down to it, the Muppets, after all, are really clowns in the classic sense. If you don’t believe me, just look at Kermit. Not only does he have the laughing/sad eyes of a clown, he wears a clown’s frill around his neck. What, you’ve never thought about that? In nature, frogs don’t have frills, but clowns do. The best clowns have an ability to show us the truth in a way that makes us laugh even as the shock registers. Clowns know how to catch us by surprise, how to do the unexpected, how to cloak profound truths in entertainment and humor. Nobody expects a bunch of glorified hand-puppets to be dealing with existential issues of self, and deep yearnings for happiness and fulfillment. Yet it’s perfectly believable when they do. That’s the magic of the Muppets. There’s something about watching these absurd, colorful, fuzzy little creatures that creates an artificial distance, and that distance adds potency to the message and gives it space to cut through. I, for one, couldn’t be happier to know that the Muppets are back. Let’s face it, in times like these, we desperately need our clowns, at least the ones who know what they’re doing. I would agree with your review of the movie. I liked that there was a picture of Jim Henson with Kermit on the wall of Kermit's old office - a nice tribute to Mr. Henson. I agree with your discussion of the theme being expressed in this movie and I think the childlike way the muppets look at the world is attractive to kids and adults alike. When I say "childlike" I'm referring to the way it is expressed, not the importance or relevance of the theme. I have to admit, I never saw Kermit's frill as a clown's frill - I just thought he was a special kind of frog - with a frill. 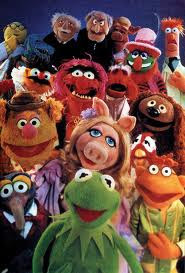 None of the muppets are quite what they should be - all of them really misfits and just a little left of normal (some more than a little left - see Gonzo). Perhaps my inability to notice the Frog Frill (try saying that five times fast), was more demonstration of how easily it is to get drawn in by the muppets to their way of viewing he world. It is easy to be assimilated into that warm fuzzy ideal because these "puppets" seem so genuine. Hutton: It was cool to see not only Henson, but all the celebrities who had appeared on the show or in the movies over the years on the wall. Your point about the childlike quality of the muppets is well-taken. I think that's pretty much where I was heading, but decided I'd better stop so I could finish the post and move on to other pressing things. As far as Kermit's frill goes, I'll admit I never thought about it either until I was working on this post and "thinking deeply about small things," as is my want. It's funny though, isn't it, that whether intentionally or not, giving Kermit his frill adds a visually comic quality to him, even if it's only noticed subliminally. There had to be a reason for creating him that way; otherwise, why not just change his name to Kermit the Collared Lizard? Thanks for reading, and for the great comments!